We are also proud to announce that Close to My Heart wants to help those affected by Hurricane Sandy. To show our support of Red Cross relief efforts for those areas of the US severely affected by Hurricane Sandy, Close To My Heart will donate $1 for every Stamp of the Month set sold as a part of this promotion during November. In this hop, you will see projects featuring this fun stamp set from many talented crafty ladies! 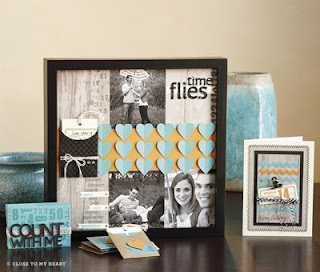 If you came from " Jennifer " of " 4 Hearts Scrapbooking" then you are in the right place! I stamped Happy Birthday using White Daisy pigment ink. The birthday stamp is from the Art Philosophy bundle. Your next stop on our Capture the Date blog hop is " Stephanie " of "The Quilted Scrapper". I love how you did the background of this card. The flowers are so pretty. Thanks for sharing.